Things To Do In Los Angeles: Beautiful Big O Review: Roger Smith! It's showtime! The steam-punk Batman rip-off with robots is back and on Blu-ray. Since its start on Toonami its been a mega-sized punch for anime fans wanting a neo-noir story about a robot pilot and a city that's lost its memories from 40 years ago. 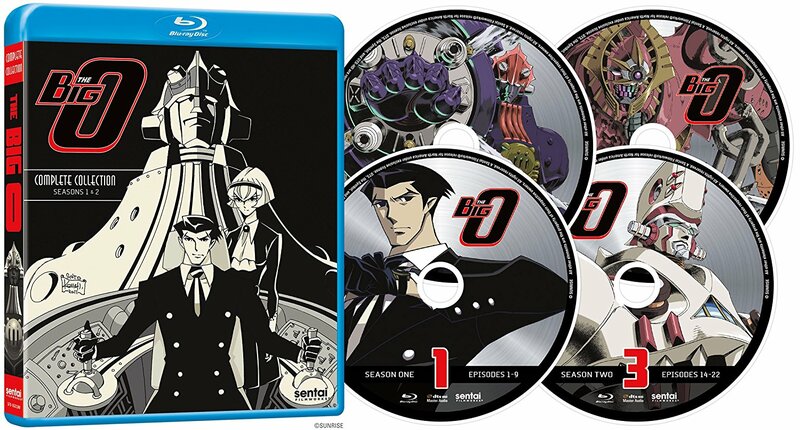 Let me just write that Sentai has done a wonderful job collecting the show and putting in on Blu-Ray. If you've ever wanted to see the show in its highest quality with its great music, cept' for it's ever-changing opening theme then you need to pick this up. Let's just smash through on that opening, it was terrible when it came out and since it came out it had to be changed three times due to legal reasons. The latest theme song sounds like a rip-off off The Kinks - "You Really Got Me" so maybe in a few years a newer theme song will have to come out. That's my only qualm with any content in the Blu-ray collection. I only noticed it once when it was inserted into the show proper and man, it did not fit in the action scene. For those who don't know about the Big O. Let's take you through it to get you excited about one of my favorite animes. Roger Smith is a negotiator in Paradigm City, a city that has lost all its memories prior to 40 years. A negotiator is someone who settles disputes. On top of that he's basically Bruce Wayne/Batman. If Batman had to deal with giant robots. The main reason why he looks Bruce and the show looks like Gotham city is because the Japanese animators, Sunrise, did the animation for Batman: The Animated series and created this show. Paradigm City and its dome cities should still win awards for their inventive look. A city-scape trapped behind a curtain of metal and glass. Fallen buildings from a disaster that took place that no one can remember. So Roger Smith pilots the Big O, a giant hammer-piston punching robot with special moves that defends Paradigm City from all manner of robots, super villains and monsters. He's helped by his Butler Norman akin to Alfred and R. Dorothy his android companion. The live in a mansion that used to be a bank building. The series goes beyond its simple premise of a new baddie every episode with an overall arch over finding memories, foreign countries attacking and Paradigm's evil CEO coming up with dastardly acts for unknown reasons, later fully realized in the ending episodes. Oh, and things get really weird in those ending episodes. Many people find the ending to just be plain terrible and I agree after watching it again. 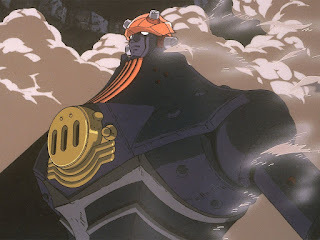 I'm writing bout, Evangelion levels of what-the-f*ck? The ride on a giant robot getting there however is well worth the trip. Big O's story is so reminiscent of Batman: The Animated Series it's hard to not to think of it as a weird spin-off. With great musical scores; even one episode has to deal with learning piano and turning that into a deadly weapon, makes the show so much fun to take in as robots battle each other. Oh, and the battles are downright crazy to watch. The show fully realized how big The Big O is and its counter-bots and makes you feel like the world's coming down or you're right in the fight. You can't wait for Roger Smith to call out, "It's Showtime!" on his watch communicator to summon Big O. 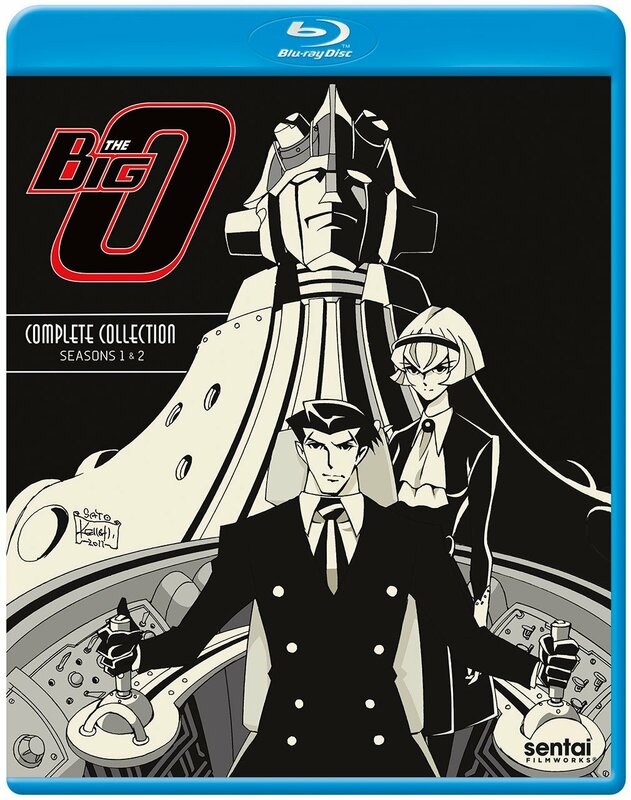 And the set-up inside the Big O and how it's operated is fascinating in on itself in battle. I'd say it's one well-thought out mech when it came to design. How many times does it just have a fun new toy or power to smash down bad-bots! If you've never seen it or if you've missed it, it's showtime! Pick it up this June.